Let me start off by saying, I’m a huge fan of fairy tales. Not just fairy tales, but myths, fables, tall tales, legends, folklore, etc. And I don’t love just the oldies. I’m a fan of every retelling (and there’s been quite a bit lately) that the literary world has to offer. I gobble up each one like M&M’s and gluttonously ask for more. So when I got the chance to read Baba Yaga’s Assistant by Marika McCool and Emily Carroll, I was more than just a little excited. And I was not disappointed. Now, I know that fairy tales have been making a huge comeback the past few years in literary fiction, graphic novels, and television. There’s been the Fables series (and all of its offshoots) from Vertigo, the Percy Jackson and Kane Chronicle series from Rick Riordan, the Once Upon a Time and Grimm TV shows, The Lunar Chronicles from Marissa Meyer, The Bloody Chamber by Angela Carter, and the Fairytale Retellings (yes, that’s the name of the series) from Jackson Pearce, just to name a few. However, what really sets it apart from the rest is that McCoola and Carroll chose a Russian fairy tale and made a conscious decision to give the story a childlike tone. My favorite oldies are usually creation stories. Stories don’t have to be ancient to become myths. Most re-hashed modern fairy tales are familiar Brothers Grimm or Hans Christian Andersen stories. Old Russian fairy tales, on the other hand, show up a lot less in popular media. Before I read this story, I had to brush up on my Russian fairy tale knowledge, of which I had none. I know, I’m just as embarrassed as I should be. Basically, as I learned through a quick Wikipedia search, Baba Yaga is Russia’s answer to that “wicked witch who lives in the woods and eats children” motif that’s popular in most fairy tales. This aspect of Baba Yaga’s Assistant excites me a lot, as it leans closer to a fairy tale trope I’m familiar with while still having an origin I’m unfamiliar with. The story follows Masha, a young woman who has recently lost her grandmother. After her death, Masha finds out that her father is remarrying, and it seems as though there is no place for Masha in his new life. She searches the classifieds for a way out and comes across a job posting from the infamous Baba Yaga, who is searching for a new assistant. Masha’s grandmother told her many stories about Baba Yaga and even left her a book of tales about the wicked witch who eats children after she passed away. When Masha arrives at Baba Yaga’s house, Baba Yaga puts her through a series of tests to prove her worth. 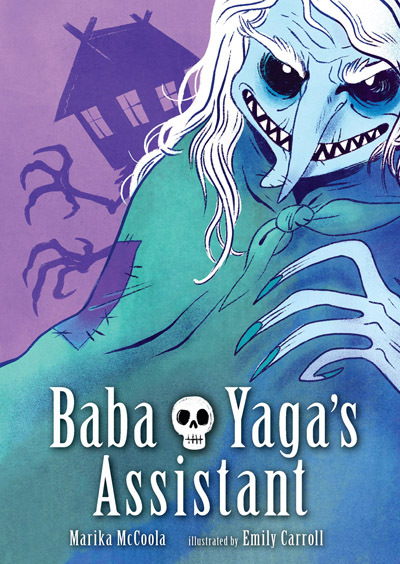 Baba Yaga’s Assistant is a beautiful tale set in a modern setting without losing that fairy tale whimsy and charm. McCoola writes an excellent story that is appropriate across the age spectrum. Like old, traditional fairy tales, it’s full of childish delight while still relaying morals and lessons. She does a wonderful job exploring issues we all face when we’re growing up: looking for a place to fit in, sticking to our personal morals, etc. She also creates wonderful characters. Masha could easily have been misunderstood as a young brat who doesn’t understand life’s complexities. Instead, the reader finds her sympathetic and roots for her along the way. Baba Yaga herself is equal parts scary and intriguing. It will be interesting to see their relationship develop along the way. Even Baba Yaga’s house has a personality that comes forth easily through her narrative. Emily Carroll’s beautiful art enhances the story by looking adult but still keeping some of the childlike imagination that is invoked by McCoola’s writing. For example, her interpretation of Baba Yaga is very scary (she has pointed teeth and black eyes for Crone’s sake! ), but not so scary that she falls out of sync in with the story’s whimsical atmosphere (she wears funny clothing and isn’t all that menacing… once you get to know her). Carroll’s imaginative recreation of Baba Yaga’s house works beautifully with the personality that McCoola has given it. Let’s just say it will only cooperate if you have good manners. Overall, McCoola and Carroll worked wonderfully together to create a memorable graphic novel. Baba Yaga’s Assistant isn’t very dark or dramatic like some other modern retellings (Fables and The Bloody Chamber for example), which isn’t a bad thing. Readers of this story will find joy in the story as well as appreciate a solid fairy tale retelling. The characters and illustrations harken back to a more innocent time in our lives while still maintaining your adult attention. I recommend it for anyone who is a fan of fantasy, even if you think you have heard the tale before. I was given a free e-galley by Candlewick Press in exchange for an honest review. Brittney is a big femmy feminist who loves books. Like, really loves books. She's also a psychology nerd who is silently diagnosing you during conversations. When not in her armchair, she loves hanging out with her boy toy and her pup.